Today's post is for those of you who write non fiction. November isn't just National Novel Writing Month (aka NaNoWriMo). It's also the month of the Write Nonfiction in November Challenge (WNFIN), or National Nonfiction Writing Month (NaNonFiWriMo). You can find out more about the challenge and register to take part here. I found this infographic by Joel Orr at http://infographicaday.com/joel-orr-on-writing-a-good-non-fiction-book-quickly/ and agree this his advice. 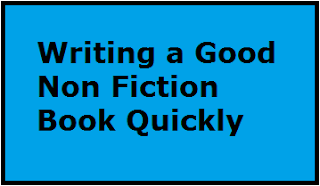 Do you write non fiction? are you taking part in the NaNonFiWriMo challenge this month? Any thing you'd add to this list?